The U.S. has exported much of our electricity and water use because we have a declining manufacturing sector and instead import lots of goods from places in the world where dams are still being built. The fight is far from over as far as dams are concerned. The biggest fight in our neighborhood is over the four Snake River dams, which Duncan talks about. Also, in California there is talk for the first time in decades about building new dams and they are on a ballot measure this fall which will likely pass. 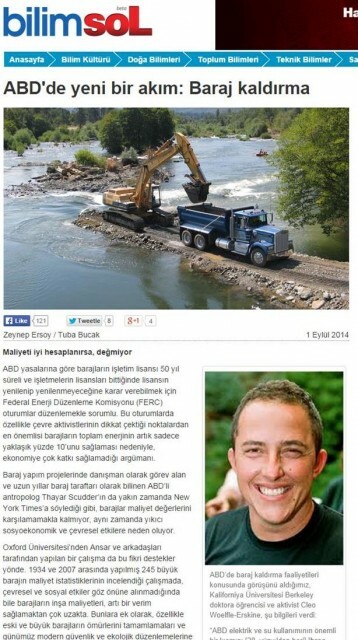 Bilim Sol’s original article on US dams in Turkish can be found here. Next post: Will Dr. Harte’s MaxEnt lead to a unified theory of ecology?